Hello, Friends aap sabhi ka hamare blog me bahut-bahut welcome hai. 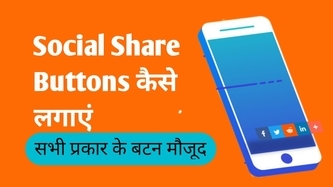 Is post me hum aapko batayenge ki "How to Add Custom Social Share Button For Blogger" ya agar hindi bhasa me bole to "Blogger me custom social share button kaise add kre. Lekin inka use krne se pahle aapko pta hona chaiye ki "social share button" akhir hota kya hai? Social share ko najdik se gaur krne per aapko isme 2 word dikhai dete hai, Isme pahala hai social and dusra share. Social word ka mean samajikyani ki samaj me hone wali gathividhiya or share ka mean hota hai ki kisi bhi cheej ko failana ya logo tak bhawanao ko pauchana. Iska full meaning hai ki social share ke dawara internet ki koi baat ko pauchane ka ek madhyam. Social share button ko blogger ya wordpress and another platform per use kiya ja shakta hai. Social share platform Facebook, Twitter, Instagaram and Whatsapp etc hote hai. Jab hum kisi website per visit krte hai to humko website me social share button jarur milte hai, Agar hum in button per click karke post ko social share platform ke jarye logo tak paucha shakte hai. Aapko Blogger me custom Socail share button add krne se pahle kuch step aayenge usko carefully pura krna hoga. Friends aapko isme whatsapp and other saare share button mil jayege. Iske sath hi sath agar aap floating share button apne blog per activate krna chahte hai to floating button bhi ishi post me mil jayega. Step 1. Sabse pahale aapko niche ek website hai us per click krke Gmail, Facebook se account activate kar le. Iske baad uska dashboard open kar le. Step 2. Social Share website ka Dashboard open hote hi aapke samne bahut sare feature and plugin milege. Iske baad aapko apni Upper me Tool Option aayega to is per click krna hai. Iske baad screen per Add new tool+ option aayega us per click kre. And setting ke pas ek green button dikhai dega usko off kar de. Step 3. Uper batai gayi step follow krne ke baad new screen open hogi, Isme aapko six option dekhne ko milege. Aapko first option share buttons per click krna hai. Step 4. Share buttons per click krne ke baad aapko seven type ke share button milege. Aapko apne anusar koi bhi buttons ko select kar lena hai. Me isme Expanding wala option select kar leta hu. Step 5. Style ko select krne ke baad aapko "Continue" per click kre. Iske baad hi activate tool ka option per click kar de. Step 6. Iske baad aapko bell icon ke pas " Get Code " ka option per click krna hai. Get code per click krne ke baad aapke samne kuch rule and coding language aayegi. Step 7. Ab aapko page ko niche slide krne per code milega us code ko pahale to carefully copy karna hai. Dhyan de ki koi sare word acche se copy ho jaye. Iske baad aap apne blogger ke theme section per jaye and Edit Html per click kre. Step 7. Iske baad aapko apne keyboard me "CTRL+F" press krna hai to side me search bar open hoga. Aapko search box me </body> dalkar Enter press krna hai. Iske baad nche </body> niche yellow color me highlight hoga. Aaoko copy kiye huye code ko </body> ke theek uper paste kar dena hai, jaise niche photo me diya gaya hai. Iske baad aapka social share button aapke blog per succesfully lag chuka hoga. Maine ye rasta kyo choose kiya kyoki isme pta lag pata hai ki hamari post kitne logo ne share ki hai.Friends aap sabhi agar hamare blog se nai nai jankari receive krna chahte hai to subscribe,and comment kre.